We had a lovely visit with Alyssa and her girls last week. FIVE little girls in one house is guaranteed to be really fun and really tiring. Jane decided she didn't really want to sleep while her cousins were here so Jane and I were exhausted by the time everyone left (one day early even). It has taken me a bit of time to recover! 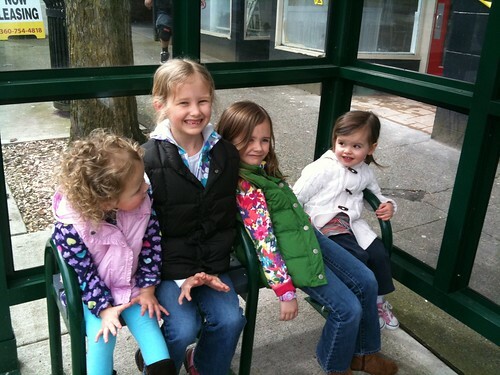 Eden and Cora and Neva are so sweet — and so sweet to Cate. Classic story of the differences between the cousins. On Saturday we took all the girls downtown to the see the boats and the water. We go out on this beautiful dock and Alyssa doesn't even have to hold her girls' hands as we look at the water and the jellyfish. Telfer literally has to hold onto Cate's hood as she leans so far forward off the dock that she would have been in the water headfirst in seconds. Ah. Cate. We also went to the children's museum and rode the bus downtown and went to church. All good stuff. Love those girls. I can’t believe how grown up Cate looks in this picture with her cousins! What fun! Definitely a picture to frame. I also like Cate’s look – a bit like little Jane’s face in the following post! 🙂 So glad you guys had a great visit.